With many years of experience in filtration, we have determined the best and highest quality components to achieve particle and ionic removal requirements. We can supply filters for almost any application. 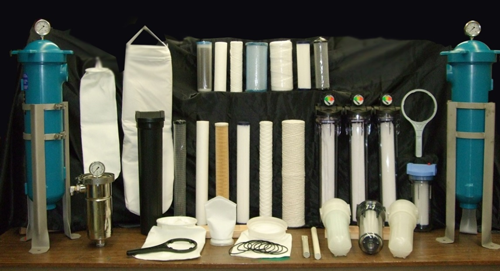 We offer a variety of filtration options including nominal, absolute, and membrane filtration. A filter capable of removing 99% up to 99.9999% of solid particles greater than a stated micrometer size. The exact percentage is stated by the manufacturer; the higher the percentage removal, the higher the cost. We can supply membranes for most applications: micro filter, ultra filter, nano filter, reverse osmosis (listed in order of decreasing particle size). Separation Technologists has more than 700+ water treatment systems in the U.S. and abroad. Award winning system design combined with the highest quality components available has kept our products functioning successfully for many years. When the need does arise for replacement parts, we can be counted on to get you up and running in the shortest time possible. Because pumps can take as long as three weeks to get from the manufacturer, we have developed the “Quick Ship Premium Program” to assure the customer that the heart of all water treatment systems, the main supply pump, will be readily available on our shelves for an expedited shipment to their facility. When comparing the cost of this program to the costs of shutting down an entire production line, it is easy to see the value that we can deliver to an organization. Additionally, we maintain a complete inventory of sensitive items, such as gauges, special operation valves, level controls, and other important instrumentation. Having a replacement part on hand when you need it can be the most cost effective thing any manager can do, saving his company thousands of dollars in ‘downtime’. We can custom tailor a Spare Parts Package for all Separation Technologists systems and we can provide discounted pricing for these special purchases. Contact Us or call 603-952-4747 for your replacement parts and technical service needs today.